Thanks for visiting the CoilJet support section. Here you will find answers to the most common support questions our customers have. Utilize the tabs to find the appropriate selection for your needs. Soap and water is not mixing. I turn the mixing value from one end to the other and in between only water coming out. Thanks for the contributed question. This issue is general seen for a few reasons. The coil cleaning solution tank is empty, and therefore not mixing any cleaner into the water spray. Check the tank to make sure it’s full. There is a blockage in the mixing tank. Check inside the tank to make sure there is nothing caught in the drain area. You can also remove the base to see of an obstruction exists in the drain lines. The mixing valve stem has been stripped. This effectively renders the mixing valve “stuck” in a single position – in this case at zero. Contact us for support and replacement of the valve. A caustic coil cleaner was used and the acid has eaten at the mixing valve. Contact us for support and replacement of the valve. As a reminder, the CoilJet is designed for optimal use with alkaline coil cleaners. Caustic coils cleaners will degrade internal parts. If a caustic coil cleaner is required for use, make sure to remove all the cleaner after use and throughly flush the unit. Fill the cleaner tank with water, oipen the valve and empty the tank of water. If you have used a coil cleaner other than SpeedyFoam in your CoilJet please follow these instructions immediately after use. The cleaner leaks into the water tank. Is there a fix? There may be a variety of causes that may be in play here from a cracked tank to a stripped or faulty chemical mixing valve. Please contact us at 888-700-3540. My battery doesn't seem to be holding a charge. What could be the reason? There are two primary reasons for battery life issues. 1) The battery is not holding a charge and/or 2) the battery isn’t being charged properly. For the first reason, make sure that the battery remains charged at all times, especially if being stored for extended periods of time. We recommend leaving the battery plugged into the charger. The charger is a specially designed trickle charger and will maintain a proper charge. The second reason is that the charger is malfunctioning. This can present itself in a few ways which include a flashing red light on the charger or no light. A test of the charger with a voltmeter is the PRIMARY test, regardless of lights. A proper charger should read between 12-14 volts. Anything below that is and indication that the charger is broken. Contact is for a replacement or refer to the warranty section for guidelines on repair or replacement. I can't seem to get any decent pressure out of it. I've tried priming the pump but after 15 minutes or so it's still just trickling out. Does it take a long time to prime the pump? Is there an in line filter anywhere that could be clogged? No, the pump should come to pressure within seconds. Generally this means there’s a clog in the system or pump issue. Please call us at 888-700-3540 to walk through some diagnostics. My CoilJet doesn't power on. What could be causing this? There are a few reasons this may be happening. We recommend taking the following steps to identify any potential cause. Check the battery for correct voltage. Open battery compartment, remove the battery and disconnect battery wires. Check the battery voltage with a volt meter. A fully charged battery should output between 11-14 volts. If it is under 11 volts the battery needs to be recharged. Click here for troubleshooting battery specific problems. Check for blown fuse.. Your CoilJet includes a 15amp fuse located in the base of the unit. Under special conditions, this fuse may blow to protect other components. To locate the fuse remove the six screws on the bottom cover of the unit. Locate the yellow fuse holder and check its condition. Replacement of the fuse is with a standard in-line 15 amp fuse. Check for loose or damaged wiring. In extreme cases wiring can become loose or damaged, either through shock/vibration or accidental chemical spills. With the base cover still off, check for this condition. If you find loose or damaged wiring, please contact us. Check the battery charger. The battery charger should be producing between 12-14 volts. Plug the battery into a working wall socket. DO NOT PLUG INTO COILJET UNIT. If it is flashing red, the unit needs to be replaced. If the light is green, use a voltmeter to check the output. If it is not measuring between 12-14 volts, it needs to be replaced. Please contact us for replacement. How long (minute/hours) does it take to charge a new battery? How long (minutes/hours) to recharge the battery after initial charging? Charger is plugged in, green light is on, is it charging or is it fully charged? Red light? Charging the battery from an empty charge takes about 3.5 – 4 hours. The charger is a smart, trickle charger and therefore can be left plugged into the battery at all times when not in use. The light on charger has three states. Do I need to do anything special to care for the battery? It is important to not store the battery for a long time (months) with no charge. 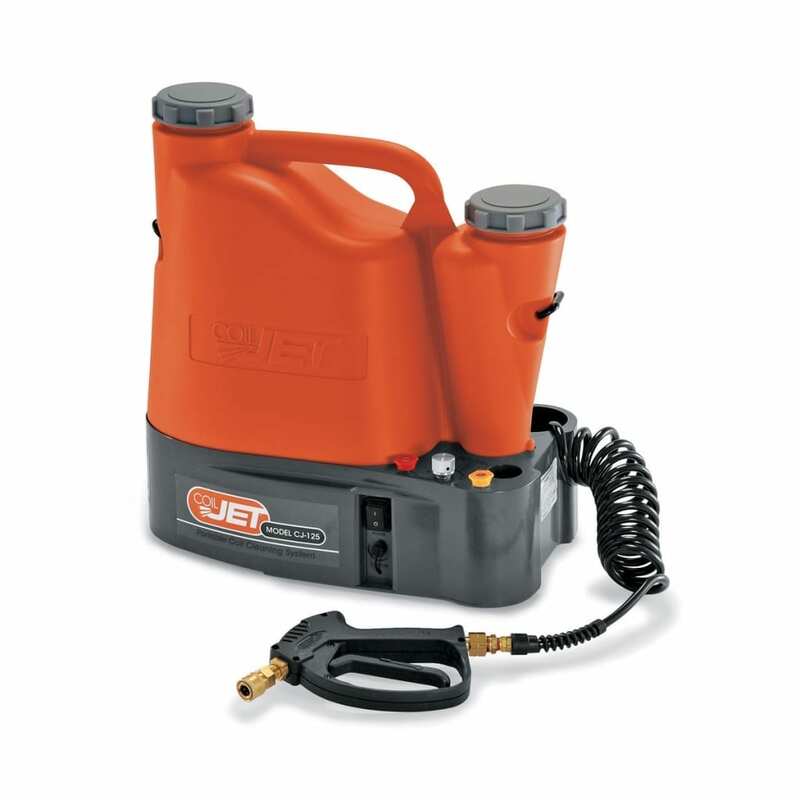 For instance if you plan on storing the CoilJet during the off-season, put it away with a full charge. In addition, the battery comes with a “smart” charger which will prevent the battery from over charging. Therefore, SpeedClean recommends that you leave the charger plugged in to the battery when storing for long periods of time. Can I use harsh chemicals or acids in the CoilJet? Not without eventually causing damage to the pump. If a chemical of this type is used in the CoilJet it is important flush the unit out with fresh water immediately afterwards. We recommend using SpeedyFoam from SpeedClean, an acid free coil cleaner delivers superior cleaning power without harmful effects to you and less harmful to the environment. Please refer to the CoilJet chemical compatibility chart in the downloads area of this support page for more information. Use of a coil cleaners that contain caustic agents such as sodium or potassium hydroxide may cause components withint he CoilJet to fail. These chemicals are highly caustic and tend to pit and eat away certain metallic components quickly. Most issues with caustic coil cleaners occur when these chemicals are left in the system for extended peirods of itme, however they may occur quicker. SpeedClean always recommends the use on non caustic and no acidic coil cleaners like our SpeedyFoam coil cleaner. They are better for the coils, safer for the operators and better for the environment. If you have used a coil cleaner other than SpeedyFoam in your CoilJet please follow these instructions immediately after use. Our product is designed to be used with alkaline, non acidic and non caustic coil cleaners, as the product includes rubber and brass compnents. Any other usage of chemical may void the warranty. Please refer to the chemical compatiblity document here. However we have heard of many customers using different cleaners successfuly. Either way, we always recommend a complete flush of the system after using any kind of cleaner. If you have used a coil cleaner other than SpeedyFoam in your CoilJet please follow these instructions immediately after use. My fuse has blown. What type of fuse should I replace it with? The fuse should be replaced with a a 15A buss type fuse. Click here, to review our CoilJet Troubleshooting guide first.